This is not a classic fruit machine, and the symbols don’t really look like stickers in the first place. To me they remind more of the fruit-shaped hard candy. But let’s not get caught up in the theme too much as the real reason the mobile slot is called Stickers is due to something else completely. It’s hard to believe, but it’s the first ever Net Entertainment powered game that was built with a ‘mobile first’ mindset. And here’s what makes it so special. 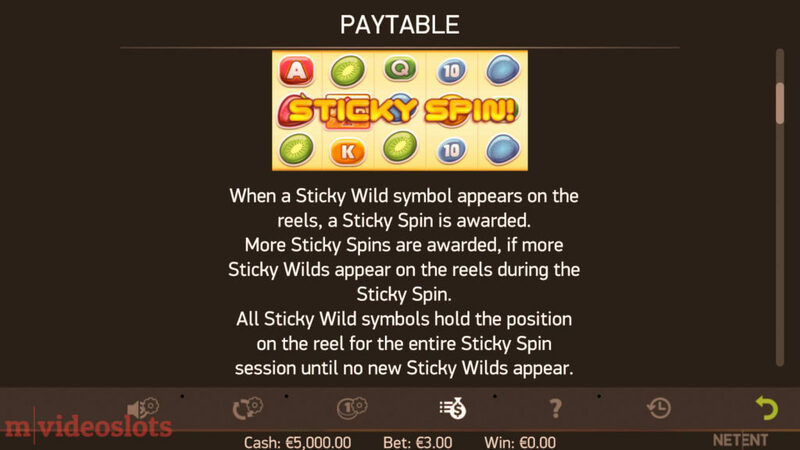 Wilds activate Sticky Spin feature with re-spins. 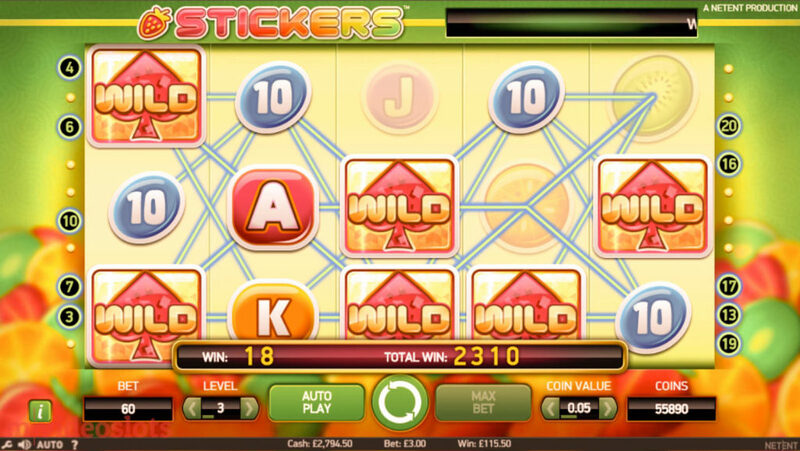 Vibrant colours and an upbeat soundtrack aside, Stickers has 20 fixed paylines. 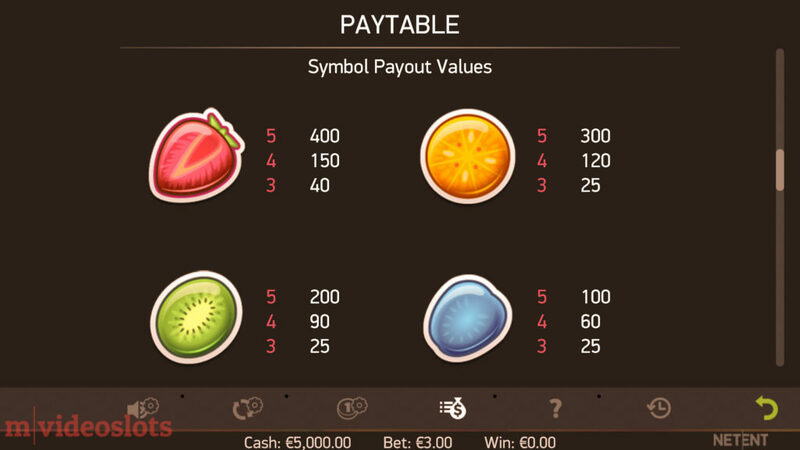 On them you’ll come across 9 basic symbols, for which you can win up to a mere 400 coins. This includes the classic fruit mix, including plums, kiwi, oranges and strawberries, which are valued the most. So you’re only hope to win anywhere near the jackpot 80,000 coins is in the hand of the Wild card. By the way, the Wild substitutes all symbols in this game, and there are no Scatters to worry about. Every single time you get at least 1 Wild icon in view the game automatically activates a Sticky Spin. As the background turns golden you win a free re-spin with that Wild stuck in its position. Guess what happens when you trigger another Wild during a re-spin? That’s right, yet another re-spin will be rewarded with more Wilds naturally stuck to their positions. 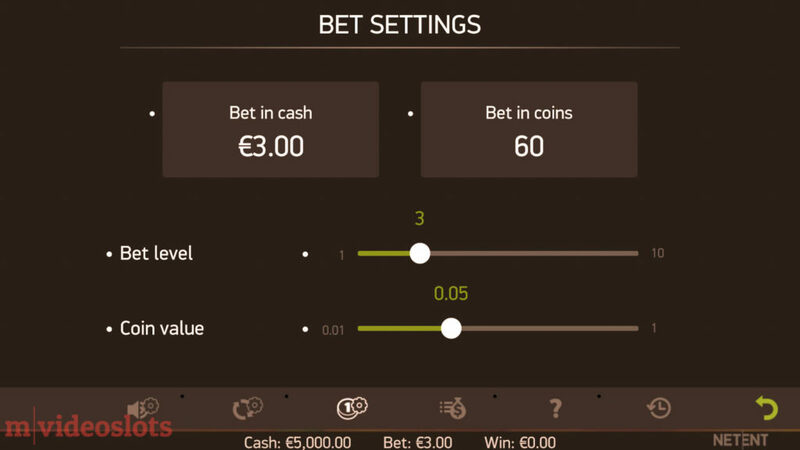 Theoretically you can fill up the entire reel with Wild symbols, which lead to the jackpot – 80,000 coins! 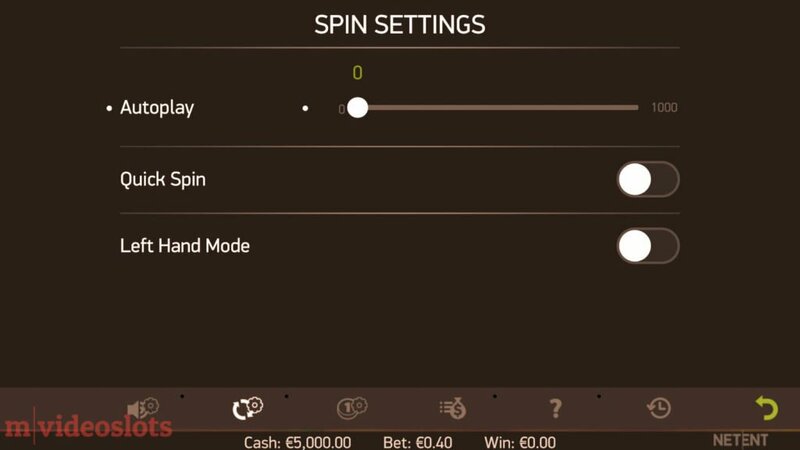 Note: You’ll find the same feature in Quickspin’s laidback Spinions slot, which also has a Free Spins bonus to boot. Stickers is a low variance machine, so wins are triggered on a regular basis. See what’s possible in the official NetEnt Stickers trailer in the video above. 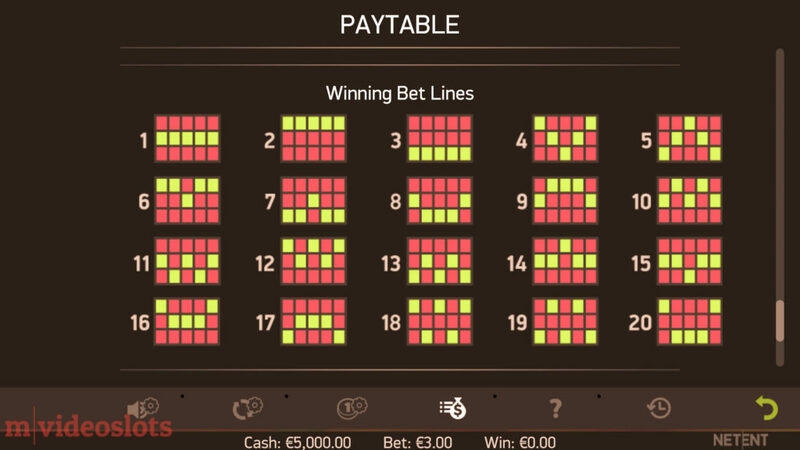 The lower risk in mind, its theoretical average return to player (RTP) is set to 96.69%, which is on par with the Scandinavian company’s other hits like the progressive Mega Fortune, as well as South Park, and Twin Spin slots. The 21st May 2015 released Stickers slot has had its glory days already. Unless you’re only after the latest releases – e.g. Secrets of Atlantis, Theme Park or When Pigs Fly – this is a great filler game to say the least. 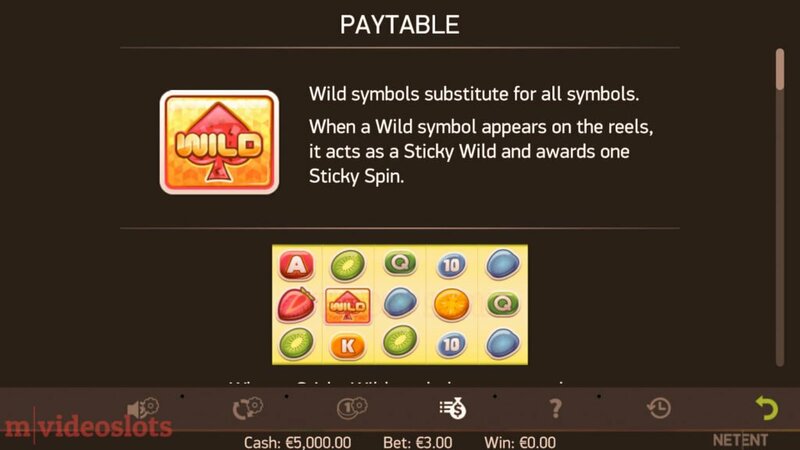 To recap, it has the Sticky Spin feature, which locks Wilds into place and awards a free re-spin for that nice 80,000-coin jackpot. If you’re happy with smaller wins and longer play time then this is a game for you. 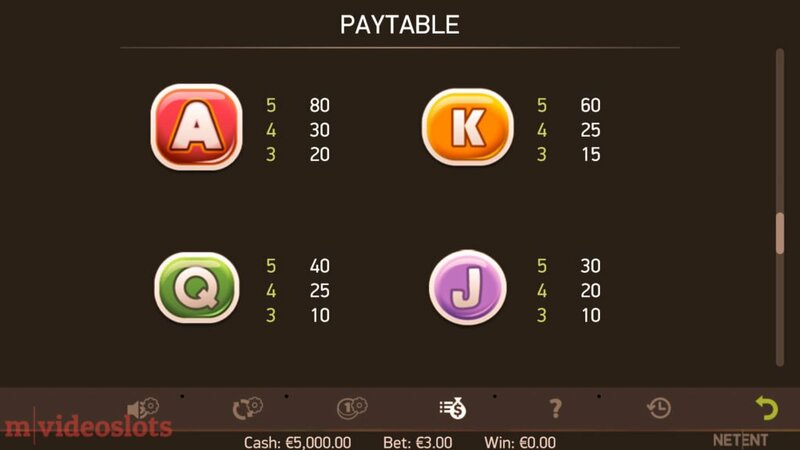 Stickers (mobile) slot is available at the 2016-launched Mobil6000, as well as Rizk and iGame casinos. Stay tuned for more new NetEnt slots. That’s the Sticky Win feature there in the paytable.